Blackmoor is a fantasy role-playing game campaign setting generally associated with the game Dungeons & Dragons. It originally evolved in the early 1970s as the personal setting of Dave Arneson, the co-creator of Dungeons & Dragons, first as a setting for Arneson’s miniature wargames, then as an early testing ground for what would become D&D. Blackmoor is one of the longest continuously played fantasy role-playing campaigns in existence. 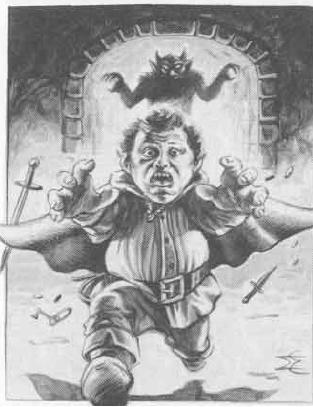 Blackmoor as a location within the Greyhawk setting came about both as an inside-joke by Gygax, and as a way for him to acknowledge his fellow writers’ creations. Having certain locations exist across the campaign settings of multiple DMs also became a convenient way to explain how player characters such as Mordenkainen and Robilar could be adventuring in Blackmoor’s City of the Gods at one sitting, while exploring the dungeons of Castle Greyhawk the next. Our campaign is a homebrew one and does not follow the canon of Greyhawk Adventures.